I just had a brilliant idea. I will move my writing desk into the bathroom. That seems to be the only room in the house where respect for privacy still exists. If someone knocks on the bathroom door, I’ll shout, “I’m in here!” and they will go away. It’s not that easy when I’m in my writing room. Yes, I have a room of my own – just for writing. It’s my only indulgence. I don’t get my nails done or color my hair, and I rarely spend money on clothes. Some women probably have closets bigger than my writing room. But I’m happiest here – sitting at my oak desk, gazing out the window at the ducks in the canal and the birds bobbing in and out of the maple tree – daydreaming, thinking and, sometimes, actually writing. When I was working full time, and using this little corner of my bedroom as an office, no one seemed to care that I was in here all night reconciling bank accounts and working up spreadsheets. No one bothered to stop in to see if I had eaten or slept in the past 24 hours. If someone knocked on the door, I shouted, “I’m working!” and they left me alone. Now that I’ve cut back my workload and decided to spend more time writing, I put away the adding machine, stowed the work files in a cabinet, and redecorated the room. I consulted a feng-shui book and moved some things around for optimal flow of chi. The desk was placed under the window so I could gaze out on the canal, since water is supposed to spark creativity. I put down a small oriental rug, hung some of my son’s paintings on the wall and lined the window ledge with seashells. The shelves are filled with poetry books, memoirs and writings by my favorite authors. If we ever sell this house, it will be on one condition: that I get to take my writing room with me. That’s how much I love being in this room. I call it “My World.” Problem is, everyone else likes to be in here too. “I’m working up here too,” I said. Most of my conversations with family members end on a similar note when they invade my writing space. I’ve tried other, more subtle, approaches to assert my privacy, but subtlety doesn’t give me the results I want. “Is the house on fire?” I ask. “Is someone bleeding?” I ask. I like to think of my writing as real work. Ok, I’m not hauling bricks in the hot sun or slapping tar down on a roof. I’m in the comfort of my own home, in the nicest room in the house, sipping coffee and noshing on Lindt chocolate balls, but I’m still working. No one takes me seriously, though, because I’m not making any money at it. Now, instead of knocking, they simply barged in. I tried locking the door, but they still knocked, and when I didn’t answer, they jiggled the handle and now the door is out of alignment. My husband mounted an old boat latch-hook to hold the door closed, but it doesn’t close tightly enough. There is just enough room for the tip of a nose and one eyeball to peer through the crack to see if I’m seriously writing or just goofing around on Facebook. 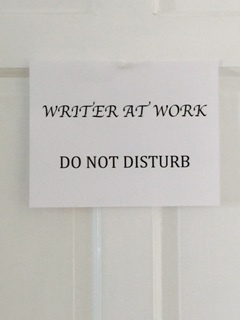 It wouldn’t matter if I was writing the next Pulitzer Prize winning novel because, obviously, whatever is happening outside my writing room is much more important than what I’m working on. Mom! Can I eat those blueberries in the fridge, or are you saving them for a pie? There are times when I pray for rain on the weekends. My husband, who checks the tides and the weather more often than a professionally paid meteorologist, will give me the forecast on a Friday night. Sometimes I get lucky. “I’ll clean out my closet,” he says, with the voice of a doomed man. I love rainy days; I always have. The tender melancholia that envelopes me on a darkened rainy day brings out the deep introspection I need for the creative writing process. Rainy days are my sanctified gift from Mother Nature, my free pass from all outdoor recreation and a guarantee of uninterrupted writing time. This entry was posted in Uncategorized and tagged A Room of One's Own, Feng Shui, Finding a time and place to write, Humor, Writing, Writing Room. Bookmark the permalink. So true. My writing room has literally become the bathroom. It’s the only place I get peace for 10 min a day (depending on what I’ve eaten in the last 24 hrs). Brilliant! Thats why my studio is in another zip code. If and when I get there, no interruptions! I feel like a fly on the wall observing the happenings. You paint a great picture like a movie set, a “talkie”. So many women will relate to that.